Amsterdam is a lovely European city to visit and I found it quite gluten free friendly, and was pleased to find a couple of restaurant gems! 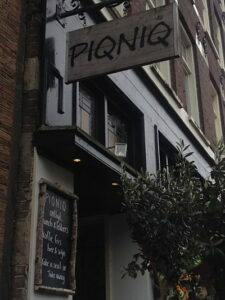 I think my favourite meal was at PIQNIQ, a little cafe in the Jordaan area. I was glad to have had a heads up about it, as I don’t think we would have found it just wandering about Amsterdam. You will find addresses and a summary of what is available for all the restaurants I found in the restaurant list for Amsterdam on the Restaurant List page. 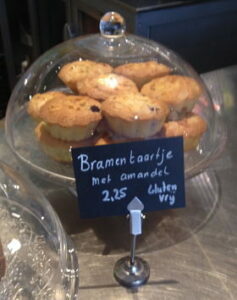 I would also recommend the great blog Gluten Free Amsterdam. This post was last updated in November 2018. 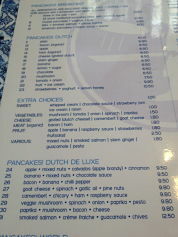 Gluten free is not marked on the menu, apart from the fact that gluten free bread is available (extra 30 cents). Chatting with the staff member (in English) was easy to establish what was gluten free and I made a selection that you can see to the right (isn’t that a lovely looking lunch?). 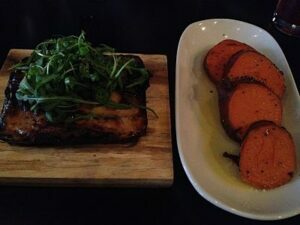 The meal was superb – simple, good flavours and the gluten free bread was amazing! I was there with gluten eaters and they also thought their meal was one of the best we had in Amsterdam. To top the whole experience off, there was also a café cat, which did allow a tummy rub, although it did not seem particularly pleased with the intrusion of its nap! If I had still been hungry, there were some gluten free muffins available, but I didn’t feel I needed anything more. 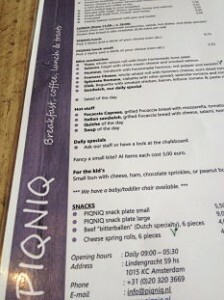 Please note that PIQNIQ is not 100% gluten free, but I felt comfortable that they understand about cross contamination issues based on reviews by The Happy Coeliac and Gluten Free Amsterdam. 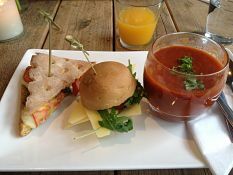 On their website it states: “As one of the few restaurants in Amsterdam we have delicious dishes prepared according to a gluten free diet. Come to us and let us surprise you!”. We visited on a Saturday lunchtime, and initially there was some concern that the GF pasta may not available at lunchtime, but some calls were made and I was presented with gluten free spaghetti with a delicious pesto, sundried tomato & spinach sauce. I could have had something else, but I really wanted to have some carbs if there was a possibility to do so! The restaurant was not busy, but had a nice feel and we had a super friendly waiter who was very good at explaining the GF pasta would take a little longer as fresh water was needed to cook it. If you sit at the only outside table, you have a nice view of the medieval ‘De Waag’ building. 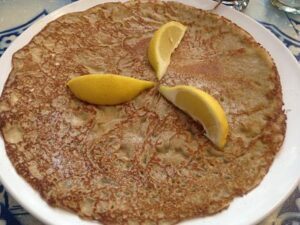 A Dutch pancake is basically a crêpe and as crêpes are up there in my top 5 favourite foods, I could not pass on having one at Pancakes Amsterdam. No one else wanted one, so I queued and sat at a table on my own – that is how much I am willing to put up with to savour a crêpe! It was not clear which toppings where gluten free, so I opted for the safe option of lemon and sugar. It was enjoyable, but I would have liked more of both the lemon and the sugar! There was icing sugar on the table, but as I couldn’t read the ingredients in Dutch, I left it off (in Australia there is sometimes wheat flour in icing sugar to thicken it, so I did not dare!). I felt happy that there were cross contamination procedures in place based on a review by Gluten Free Amsterdam. This French brasserie had been recommended to me (not because of gluten free), and I also found mention of it having gluten free options when doing my pre-visit research. As we visited on the night The Netherlands were playing in the World Cup, there were only a couple of other tables occupied. 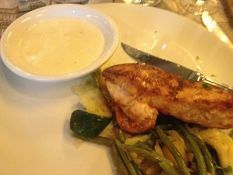 I was quite happy about this, as it meant the kitchen would be focused on a safe gluten free meal without distractions! I had a discussion with the waiter and he checked with the chef what my options were and also brought me gluten free bread – this always gets points with me! 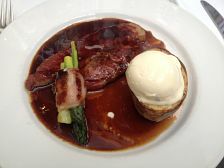 My main was ‘Berkshire procureur’ (pork) served with baked potato, crème fraiche and asparagus, which was delicious. 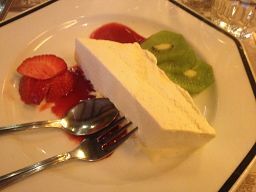 Dessert was a lovely surprise and refreshing on a warm night. 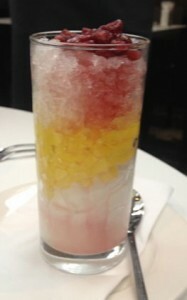 It was layered lime sorbet, limoncello jelly, granita and pomegranate seeds. This café was a surprise find that hadn’t come up in my pre-visit research. We stopped here for a drink after being on our feet at the museum, and just asked about gluten free and immediately there was a response that there were GF options, including gluten free bread! We ate lunch there that day, and also went back there another day as we were close by and the meals were so beautiful. 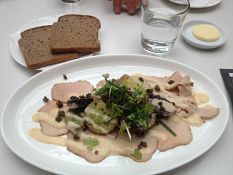 I had the veal & potato salad with capers. I don’t normally like capers, but these ones were crunchy and it made all the difference. 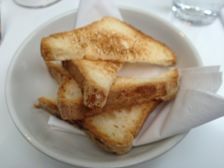 The GF bread was very nice and in extremely thin slices – most gluten free breads would not survive being sliced like that. I would love to know what it was made from, as it was fantastic not to have white bread. 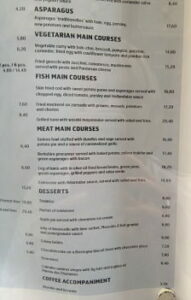 Some of the menu is shown below. Haesje Claes was literally around the corner from where we were staying, so we went there for dinner on our first night. It is a traditional Dutch restaurant housed in several old buildings, which retain original charm inside. 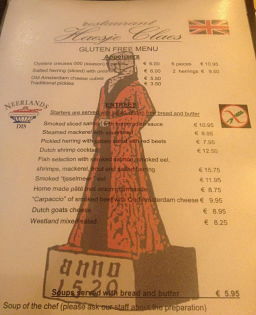 First night in Amsterdam, and I have a gluten free menu – pre-visit research pays off! 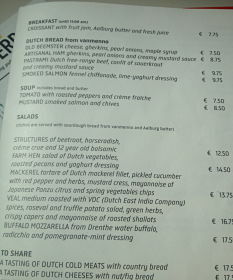 I could also choose from the ‘Amsterdam menu’, which was 23.95 Euros for three courses. My meal comprised of tomato soup, with a gluten free roll, chicken breast with boiled vegetables and then ice cream and fruit to finish, with a tea or coffee. 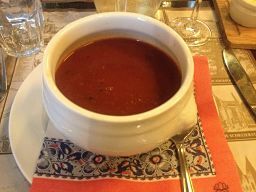 My soup came without ‘cream’ – not sure why there would have been gluten in that, but it saved me some calories anyway! Cau is an Argentinean steak house chain, but also has vegetarian options. This came up on my pre-visit research and I did not realise they also have several branches in the UK (and of course I spotted one the week I was back from Amsterdam). The steak would have been a good gluten free option, but I didn’t feel like a big meal, so opted for the aubergine (egg plant) bake with a side of sweet potato. It hit the spot nicely and the restaurant had a good vibe. The waiter did not seem to know about gluten free, but studied my translation card carefully and advised me on the options. 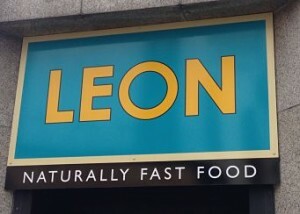 Leon is a favourite of mine in the UK and they have stores at Schipol airport and Utrecht Central train station. 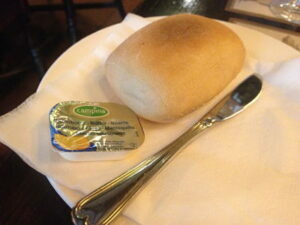 Click here for my UK review, or here for fellow blogger Forever Free From’s airport review. 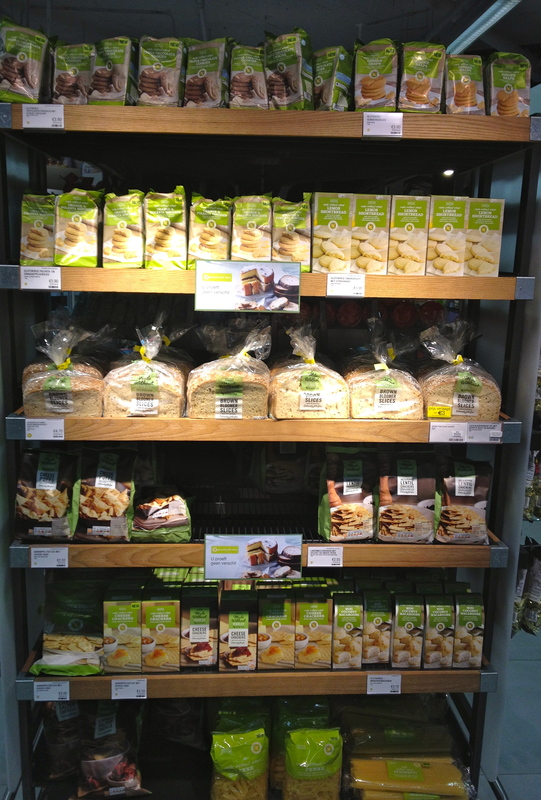 If you are self catering, I found a good gluten free section in the UK food store Marks & Spencer (M&S) – the GF items were in several different areas, so it is worth looking around to find what you need. There were also good supplies in a supermarket called Marqt, which is a bit like a Whole Foods store. 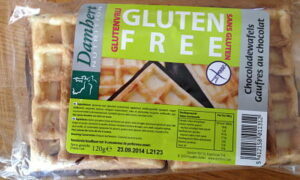 I saw my first ever gluten free waffles there – lovely toasted with some butter! You will find bread and rolls (Schar), pasta, flour, bread mix, cereals and snacks. There were also some UK brands of snacks, such as Tyrrells, Pop Chips and Proper Corn. Overall, Amsterdam was fantastic for gluten free because I had done my homework before visiting and knew where to go. 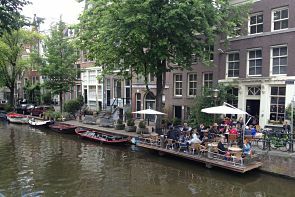 Please go to the Restaurant Lists page for a six page listing of Amsterdam restaurants. Do you have any other suggestions? Please comment below! I know your trip was a while ago now, but I’ve just arrived in Amsterdam with my gluten intolerant tummy and was doing some research re where to eat. Your post is fantastic! I’ve marked several of these places on my map! 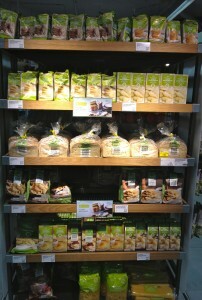 And as a Brit I can totally confirm that the M&S gluten free/’free from’ range is awesome. 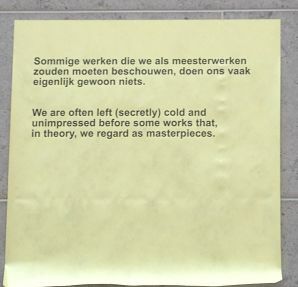 Planning on the rijksmuseum tomorrow and I now can’t wait to investigate the cafe. Thanks for your help! Yes, salad and steak often the go for me too – glad I’m not vegetarian or it would be even harder! I had two weeks in France a couple of years ago and it was pure torture walking past all the crepe stands and seeing all the croissants and pain au chocolate at breakfast….